Hi all - I am posting this late - but wanted to get it in before I head to bed. Hope your Monday was good as a Monday can get. 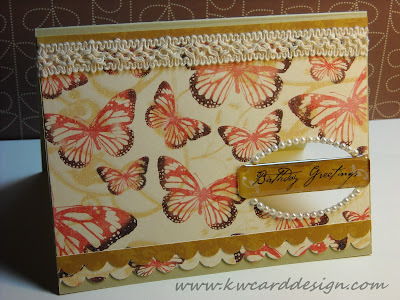 :o) I wanted to share with all of you this Birthday card I made for my mother - in- law's sister's birthday that is coming up. She asked for me to make her a card - and of course, I said yes without any hesitation! This is another "window card" but with a bit of a different variation. I just love Epoxy stickers. 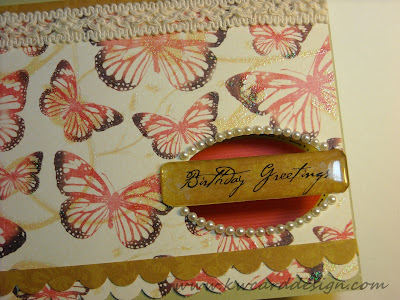 They give a different "flare" to a card or scrapbook page. I thought this card had a vintage antique feel. Very feminine. Hate to cut this one short - but got to get ready for another work day! Night all!! Wow, and WOW, what a lovely card. Love the window, paper, pearls...well everything about it. Great card Kari!!! I love the pearls - a great idea to line the opening with them!